As far as I know there are only two major remote control hobby shows here on the West Coast and they’re both held right here in Southern California. One is the AMA EXPO which is held in January and then there’s the RCX which will be held this year on May 17-18 at the Orange County Fairgrounds. That, by the way, is a little less than a month away as I type this. 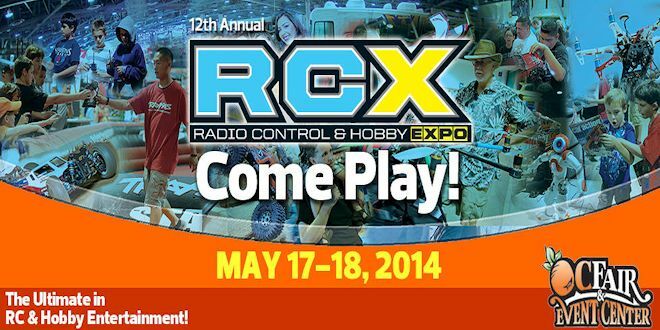 The RCX used to be primarily an RC car show which basically ignored the aviation side of the hobby, but that has changed dramatically over the last several years and now the show supports both. I’m not much of an RC car enthusiast, but I’ve helped run the flight demonstration areas at the RCX since 2009 and I’m glad to say that model aviation is at least as well represented as the cars are now. And this year should be better than ever! Among other things, the RCX has moved to the Orange County Fairgrounds this year and that opened up some exciting new possibilities which include a large outdoor flight demonstration area. Of course we’ll also be flying indoors too, and between the two flying areas you can expect to see non-stop action by a host of top sponsored pilots. But this isn’t “just” a model aviation show, either. There will also be RC car racing, slot car racing, robot battles, RC rock crawling, RC tanks, RC tractor pulling, RC mini-truckin, MHRA drag racing, and that’s only a partial list. Of course there will also be exhibitors from all aspects of the RC hobby and vendors with deals on the latest and greatest RC products. And please stop by and say hi if you go! Just ask for PGR in the indoor flying area. See you there!